The science couldn’t be clearer. With Core Omega-3 Plus D, you’ll feel and look great at any age. It’s a total UPGRADE to your healthy aging regimen. Unfortunately, most fish oil used in nutritional supplements comes from “aquacultured” fish. That’s just a fancy word for fish raised in artificial “farms” And these farms literally brim with chemical contaminants and pesticides. Even the FDA acknowledges as much. Plus, the FDA admits that these contaminants a nd pesticides may accumulate in aquacultured fish through their feed. Fish oil may have even more concentrated levels of these contaminants and pesticides than the whole sick fish from which the oil was taken! The FDA says you can probably eat one meal with contaminated fish and not run into trouble. But any more than that and you’re playing with fire. So, where does that leave you when it comes to taking a concentrated fish oil supplement every day? Not in a very good spot, I’m afraid. That’s why Dr. Micozzi insisted that the fish oil in Core Omega-3 Plus D come ONLY from healthy, well-nourished fish living in fresh, clean, natural and unfarmed ocean waters. In fact, Core Omega-3 Plus D contains only “clean” Omega-3s from wild-caught anchovies. 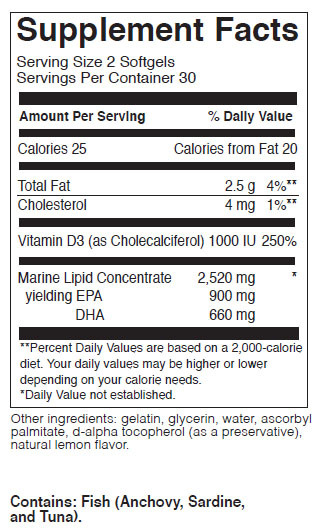 Plus, the fish oil in Core Omega-3 Plus D goes through an extra, molecular-distilling process. So you know it’s ultra-purified and extra safe. First and foremost, fish oil is good for your heart. In fact, according to the American Heart Association, Omega-3 fatty acids found in fish oil help maintain a regular, strong heartbeat. And this is key to living a long, healthy life. Plus, Omega-3s keep your blood vessels healthy and clear. And they promote healthy cholesterol levels too. As Dr. Micozzi always says, cholesterol isn’t the enemy it is made out to be. You need some in every cell in your body. And Core Omega-3 Plus D helps you achieve this fine balance. Of course, Omega-3s also help you maintain healthy blood pressure…they promote healthy CRP levels…and they support your triglyceride levels as well. Plus, a 2006 study found that men had a better chance of keeping a positive mood in their 70’s, 80’s, and 90’s when they had an average daily intake of 400 mg of omega 3s per day.. And they stayed focused on the bright side of life. That’s great! But with Core Omega-3 Plus D, you get a whopping 2,500 mg of ultra-purified Omega-3s in every dose! And we haven’t even scratched the surface when it comes to Omega-3s. An exciting new report is changing how experts think about fish oil. It found that fish oil actually regulates B cell activity. And this type of white blood cell plays a critical role in your immune system. Researchers think the Omega-3s found in Core Omega-3 Plus D may actually help keep your immune system running like a finely tuned engine. It’s no small secret that most of us living in the United States don’t get enough vitamin D3! In fact, up to 70 percent of adults in the United States actually have “insufficient” levels of this critical vitamin. But you need optimal levels if you want to live a long, healthy life. In fact, in a new landmark study, men and women with higher blood levels of vitamin D3 lived significantly longer. Plus, researchers uncovered a very strong “dose-response.” That means, the higher the participants’ vitamin D level, the longer they lived. And that’s exactly why Dr. Micozzi insists on adding 1,000 mg of vitamin D3 into every softgel capsule of Core Omega-3 Plus D.
So, in each softgel of Core Omega-3 Plus D, you’ll get 2,520 mg of “clean” Omega-3s. 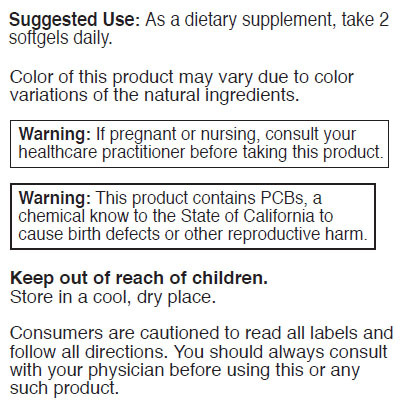 (Each softgel contains 900 mg of EPA and 660 mg of DHA.) Plus, you’ll get 1,000 mg of vitamin D3 for added protection. And that makes Core Omega-3 Plus D truly a total UPGRADE to your healthy aging regimen. Lastly, when you take Core Omega-3 Plus D, your taste buds and stomach won’t dread the experience. We purified out that “fishy” taste. And added a refreshing splash of lemon. So, when you take Core Omega-3 Plus D, you won’t even know you’re taking fish oil from the freshest, wild-caught anchovies. I guarantee you WILL notice a difference in how you feel and look when you take Core Omega-3 Plus D! Order Core Omega-3 Plus D today.